According to the abstract, the article explores the potential role of social media in helping movements expand and strengthen their impact, utilizing a case study of the Black Lives Matter movement to present the possibilities of social media to build connections, mobilize participants and resources, build coalitions, and amplify alternative narratives. The article was co-authored by Marcia Mundt, a public policy doctoral student, along with Dr. Karen Ross, assistant professor of conflict resolution, and Charla Burnett, a global governance and human security doctoral student. The publication is available as an open access article here. Saadia Ahmad, a 2017 graduate of the Master’s degree in Conflict Resolution, recently participated in the inaugural forum of the Muslim Jewish Interfaith Coalition (MJIC) in late August. The conference brought together 60 young adults who identify as Muslim or Jewish from over 30 countries to Essaouira, Morocco for a week of building relationships, learning about one another’s religions, forging new professional networks and possibilities for collaboration, and exploring the Moroccan city’s rich history as a place of peaceful coexistence among Muslims and Jews. Saadia is also a Fellow with the Center for Peace, Democracy, and Development, through which she worked with Darren Kew, Center Director and Associate Professor of Conflict Resolution, on a 5-year USAID project on creating faith-based mediation systems to mitigate violence between Muslims and Christians in Nigeria. She can be reached at saadia.ahmad001@umb.edu. McCormack Speaks: What were some of the highlights of the program? SA: The structure of the schedule, guest speakers, discussion groups, and visits to religious sites were immensely helpful in gaining content knowledge about the history and theology of Islam and Judaism and experiencing the culture, people, and hospitality of Morocco. That being said, what I often most benefit from and appreciate in these programs are the informal interactions and relationships that blossom in between all of the programming. It was during these moments of conversation, both serious and lighthearted, where I was able to learn more about the spiritual and political interests and questions around Muslim-Jewish matters that I came in with. McCormack Speaks: Why was this interfaith program of interest for you to attend? SA: I’ve been involved as a participant and as a facilitator with many interfaith programs over the last seven years that bring people together to talk, explore similarities and differences between traditions, build relationships and understanding across (and often within!) religious groups, and develop partnerships for working together in the long-term. This was my first interfaith program that focused specifically on relationships between Muslims and Jews. I’ve been looking for this for a while, as many of the programs and organizations I’ve been involved with thus far focus primarily on Muslim-Christian relationships and interfaith dialogue between multiple religious groups. Depending on the religious groups that are present, there are different topics and questions on the table that are specific to those religious groups and those distinctive relationships. For Muslims and Jews, for example, the Palestinian/Israeli conflict is the obvious and stereotypical example of a topic that is of special importance to Muslims and Jews and Muslim-Jewish engagement. Equally important issues are the shared experience of being minority religious groups in the West and, with that, the potential for collaboration and supporting one another through all the challenges that a minority status entails. Additionally, I’m in a phase of exploring questions around my faith and have shifted in some of the ways I practice and identify with Islam. In conversations with some of my Jewish friends and reading the work of Jewish authors, I’ve come to appreciate how the tradition emphasizes intellectualism, asking questions, and creates space for those who identify as Jewish but who may not practice – something that is also present in my own tradition but is not mainstream in the same way. I was very interested in hearing how Jews as well as other Muslims engage with their faith and issues affecting their religious communities in ways beyond normative practice, ritual, and belief. In other words: what does it mean to be a Jew or a Muslim who identifies deeply with the religion, but not engage in some of the traditions and practices expected of someone who claims a religious identity? This program created the right space thematically, geographically, and logistically to explore all of the above. McCormack Speaks: How did you first decide to pursue work and advanced studies in interfaith dialogue and conflict resolution? 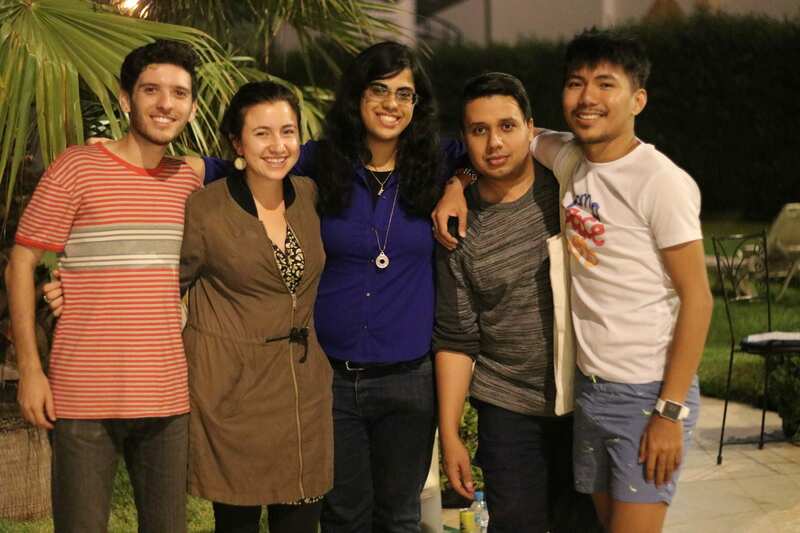 SA: I first became involved with interfaith dialogue and peacebuilding during my undergraduate studies as a Muslim at a Catholic college, where I experienced the benefits of positive interfaith exchanges. Through regularly attending Catholic worship services, taking theology courses, participating in Campus Ministry, and serving on its Pastoral Council, I experienced my own Islamic faith sophisticating in unprecedented ways. I realized the potential for religion to unify and heal rather than to divide and harm and created the college’s first interfaith organization to facilitate such encounters and also to support non-Catholic members of the community. As only 20% of the Muslim student population at the time, I also encountered hostility and misunderstanding around my religious and racial identities. I witnessed significant misunderstanding of Islam and realized the need for more Muslim public intellectuals and for greater interfaith community building efforts. These experiences – both the positive and the difficult – motivated me to facilitate and encourage positive interfaith interactions in our local and global communities. McCormack Speaks: How have your affiliations with the Conflict Resolution program, the Center for Peace, Democracy, and Development, and the McCormack Graduate School assisted with your work? SA: Our classes, professors, and classmates push us to think critically and compassionately about conflict: to ask questions that others may not think or want to ask, to recognize the humanity of the other side, to suggest that there are alternatives to harmful and destructive ways of dealing with conflict. The field experience I gained through facilitating online with Soliya, mediating small claims cases in the Dorchester District Court, and meeting with Muslim and Christian clergy and leaders in Nigeria, have helped me further develop my skills and combine theoretical knowledge with practical application. The op-ed articles I’ve written over the years – including in The Boston Globe, America Magazine, and The Richmond Times – are also informed by this approach. There’s a way in which studying and practicing in this field seeps into your bones, and you begin to view everything around you – both professional and personal matters – through the lens of what causes conflict, what may help manage or resolve it, and how you might play a role in that. 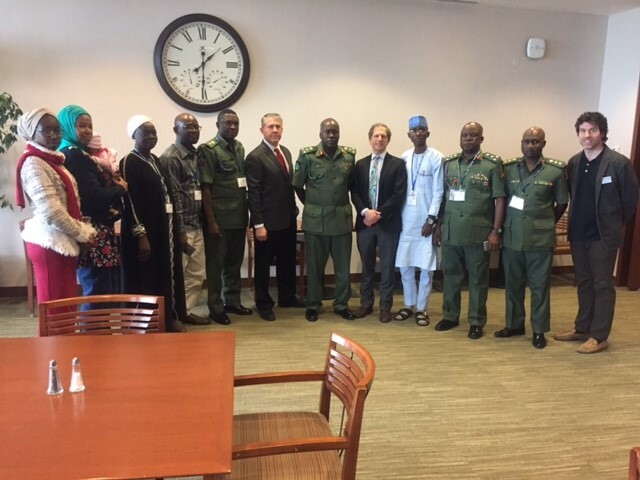 In late March, the McCormack Graduate School’s Center for Peace, Democracy, and Development (CPDD) hosted a two-day workshop on religion, peacebuilding, and conflict resolution for senior Nigerian military leaders. The delegation included a major-general and two brigadier-generals who lead the Islam and Christian chaplaincies for the Nigerian army. They seek to develop the army’s ability to work with local populations, cooperate with religious institutions and community associations, and build local peace and security without the use of force. In this highly interactive training, participants explored an array of methods through which religious conflicts can be mediated and resolved. The Nigerian delegation learned to understand the core of religious conflicts, to evaluate approaches to improve religious relations through several mediation theories and practices, and to facilitate interfaith dialogue, community outreach, and peace building strategies. Read more. The Center for Peace, Democracy, and Development at the McCormack Graduate School promotes conflict resolution, democracy, economic development, education building, media development, and legal and judicial reform through partnerships and training programs across the globe. 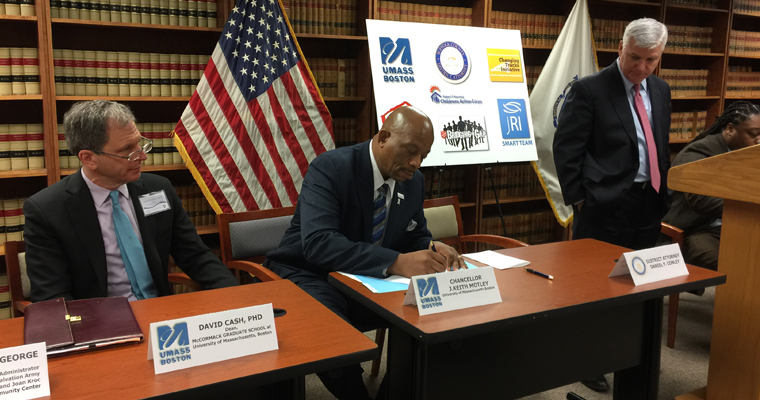 McCormack Graduate School’s Restorative Justice Project, part of the work of its Center for Peace, Democracy, and Development, recently signed a memorandum of understanding to create an initiative for juvenile offenders that uses restorative justice. The pilot project is the first of its kind in Massachusetts. 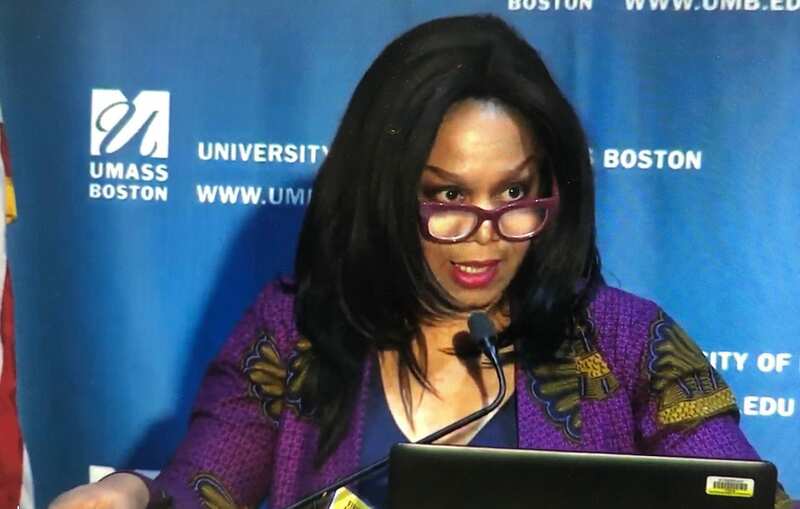 Read the news story written by UMass Boston’s Colleen Locke.